This week's lesson begins Paul! I created a set of printables that I used on a project board, but they can be used as a mini bulletin board, etc. 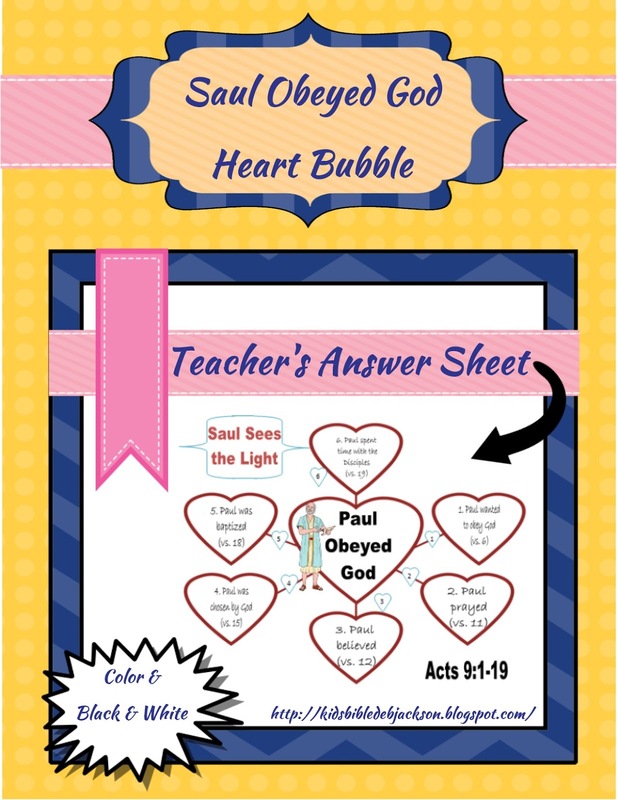 There is also a Heart Bubble Concept worksheet that works great for a discussion starter. We studied about Stephen and how the people taught others about Jesus. The people laid their clothes at Saul’s feet and stoned Stephen to death. That leads us to Saul and his life. Our scripture is found in Acts 8:3; 9:1-19 for today's lesson. We read from Acts 8:3 that Saul caused destruction for the church. He went into people’s houses and dragged men & women to prison. Saul was threatening people and murdering them for telling about Jesus. Saul grew up in Tarsus and was a Jewish leader and was very smart. Saul was glad to see people dying because they told about Jesus. He was still following the Old Testament rules. Saul was in Jerusalem and went to the high priest and asked for letters so he could go to the synagogues in Damascus and bring back anyone that was teaching about Jesus. He wanted to make sure the Christians were in prison. It was about 140 miles from Jerusalem to Damascus. That would probably take Paul and the other men about 5 or 6 days to travel. As they were traveling closer to Damascus, at about noon, (Acts 22:6) suddenly a light came shining around Saul from heaven. The light was brighter than the normal afternoon sun. (Acts 9:4) Saul fell to the ground and Jesus said to him: “Saul, Saul, why are you persecuting Me?” Saul asked, “Who are You, lord?” (lord: term of respect, like sir) And the Lord answered: “I am Jesus, whom you are persecuting.” Saul was trembling and he was amazed and asked “What do you want me to do?” He was told to get up and go into the city and then he would be told what to do. The men that were traveling with Saul just stood there speechless! They heard someone talking, but couldn’t see anyone! So Saul stood up and opened his eyes, but he couldn’t see anything. The other men led him by the hand and took him to Damascus. He was there for 3 days and couldn’t see and he didn’t eat or drink anything. Saul did a lot of praying. He had some time to think about what he had been doing. He could think about Stephen’s last words before he died from the stoning. Remember, Stephen called to Jesus to “receive my spirit”. So, Ananias went to see Saul. Now. He laid his hands on Saul and told him that Jesus appeared to him on the road to Damascus and sent me to give your sight back to you. Immediately something like scales fell from Saul’s eyes and he could see. Saul stood up and went to be baptized, immediately. Then Saul ate and got his strength back. He spent time (some days) with the disciples at Damascus. In the next lesson, we will start discussing Saul's work for Jesus. For this lessons IFA handout, I gave the students these flashlights I found at Oriental Trading. They can't wait to take their bags home! I like these concept bubbles! You can fill them in with whatever information you want to discuss. AI used this heart one for "Saul obeyed God". It is a good discussion starter to dig into this chapter and read about Paul. He was introduced with Stephen, and this shows how he drastically changed his life and lived it faithfully for God. There is a teacher's answer sheet and can be used as a visual. The student sheets can be printed in color or black & white. Download them here. I love using a project board (science board, tri-fold board) for visuals. they sit real nice on a table, it's a big display, and it stores nice. I purchased the light blue board, and placed all the parts on it to get an idea of how everything would fit. I outlined and painted the grass. My husband had this LED flashlight that makes a great spotlight. I needed a lightweight flashlight but it had to have a nice long beam. I showed him where I wanted Saul and the voice bubble, and he poked 2 holes through the cardboard. After wrapping craft wire around the flashlight, he pushed both ends through to the back and twisted them together. If you can see from the tight photo, I glued one side of the voice bubble, and attached Velcro to the other side. This goes over the flashlight to cover it, but the beam is still coming through the bottom. 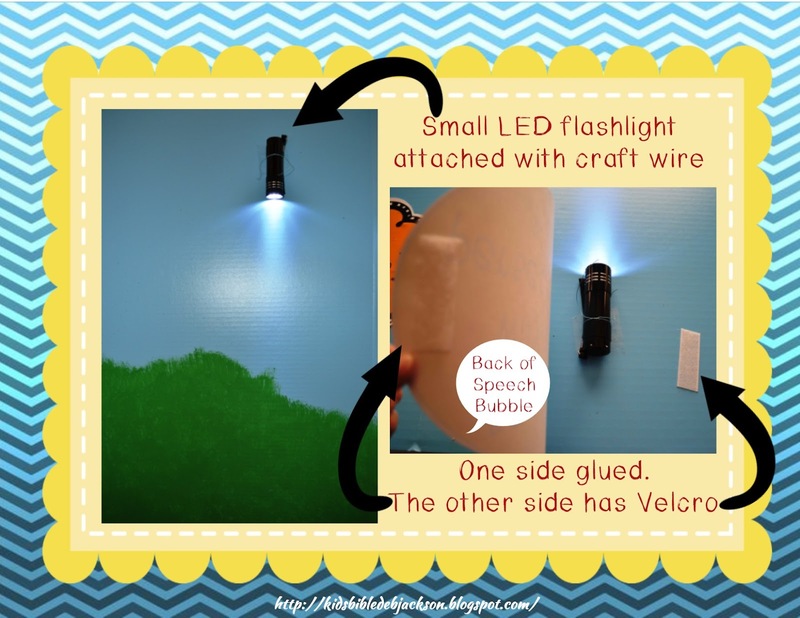 I can easily lift the Velcro side to turn the flashlight on and off and I can remove the flashlight to store the visual. I laid the men on the grass and made a painted a path for them to walk from Jerusalem to Damascus. Your option here is to Velcro Saul standing with these men, then remove that piece and add Saul kneeling under the light at the correct time. I just glued Saul kneeling under the light. I actually changed this idea from Nicole's VBS idea you can see here. This type of printables can be used as a mini bulletin board, or attach magnets to the back and use on a magnetic board. Click here to print these visuals. All the Acts worksheets are here. Click here to download the visuals for Saul Sees the Light. I tried to print the quiz/review and says page not available. Thanks! Thank you! It should work again. Thanks for letting me know. You always amaze me with these great studies! Thanks Jill! I appreciate you hosting!